The game section of the LSAT consists of four games, each of which has about six questions — sometimes 5 and sometimes 7. Thus, there are usually twenty-four questions. The section is 35 minutes long. This means that you have a little less than nine minutes for each game. Or if you skip the most difficult game, as most people should, then you have a little less than 12 minutes for each game. If this sounds fast-paced, you’re right. The LSAT is a highly “timed” test, and the game section is the most highly “timed” part. Because games are difficult and time consuming, you should consider skipping the hardest one. Unlike most standardized tests, the questions on the LSAT are not listed from the easiest to the hardest. If they were, then deciding which game to skip would be easy — skip the last game. However, this much can be said: the first game will not be the hardest and the last game will not be the easiest; do not, therefore, skip the first game. This is also true of the question-set to a game. These games require you to order elements, either in a line or around a circle. The criteria used to determine order can include size, time, rank, etc. Ordering games are the easiest games on the LSAT. Luckily, they are also the most common. Grouping games, as the term implies, require you to separate elements — typically people — into groups. Some conditions of the game can apply to entire groups only, some to elements within a group only, and some to both. This added complexity makes grouping games, in general, harder than ordering games. These games involve assigning characteristics to the elements, typically people. The most common task in these games is to assign a schedule. You probably have had some experience with schedules; you may have written the weekly work-schedule for a business. If so, you know how difficult the task can become, even when only a few conditions are placed on the employees: Bob will work Monday, Tuesday, or Friday only. Susan will work evenings only. Steve will not work with Bob. Add to this that the company must have a full staff weekdays, but only three people can work weekends. Scheduling games on the LSAT are similar to this. While no training in formal logic is required for the LSAT, essentially it is a logic test. So some knowledge of formal logic will give you a definite advantage. To begin, consider the seemingly innocuous connective “if…, then….” Its meaning has perplexed both the philosopher and the layman through the ages. The statement “if A, then B” means by definition “if A is true, then B must be true as well,” and nothing more. For example, we know from experience that if it is raining, then it is cloudy. So if we see rain falling past the window, we can validly conclude that it is cloudy outside. There are three statements that can be derived from the implication “if A, then B”; two are invalid, and one is valid. From “if A, then B” you cannot conclude “if B, then A.” For example, if it is cloudy, you cannot conclude that it is raining. From experience, this example is obviously true; it seems silly that anyone could commit such an error. However, when the implication is unfamiliar to us, this fallacy can be tempting. Another, and not as obvious, fallacy derived from “if A, then B” is to conclude “if not A, then not B.” Again, consider the weather example. If it is not raining, you cannot conclude that it is not cloudy — it may still be overcast. This fallacy is popular with students. Finally, there is one statement that is logically equivalent to “if A, then B.” Namely, “if not B, then not A.” This is called the contrapositive, and it is very important. If there is a key to performing well on the LSAT, it is the contrapositive. To show the contrapositive’s validity, we once again appeal to our weather example. If it is not cloudy, then from experience we know that it cannot possibly be raining. 1) If A is true, then B must be true. 2) If B is false, then A must be false. If you assume no more that these two facts about an implication, then you will not fall for the fallacies that trap many students. We often need to rephrase a statement when it’s worded in a way that obscures the information it contains. On the LSAT, as in everyday speech, two negatives make a positive — they cancel each other out. The statement “if A, then B; and if B, then A” is logically equivalent to “A if and only if B.” Think of “if and only if” as an equal sign: if one side is true, then the other side must be true, and if one side is false, then the other side must be false. The statement “A unless B” means that A is true in all cases, except when B is true. In other words if B is false, then A must be true. That is, if not B, then A. The two statements “if A, then B” and “if B, then C” can be combined to give “if A, then C.” This is called the transitive property. Virtually every game can be solved more easily and efficiently by using a diagram. Unless you have a remarkable memory and can process reams of information in your head, you must draw a diagram. Because of the effectiveness of diagrams, games are the best candidates for improvement. A well-constructed diagram can change a convoluted, unwieldy mass of information into an easily read list. In fact, from a well-constructed diagram, you can often read-off the answers without any additional thought. The ability to symbolize sentences is one of the most important skills you need to develop for the LSAT. Ordering games are the easiest games, and fortunately they also appear the most often. There is always one empty space. Clyde is not standing in space 1, 3, or 5. Gotti is the third person from the left. Bugsy is standing to the immediate left of Nelson. This diagram is self-contained. There is no need to refer to the original problem. If possible, avoid rereading the problem. 1. Nelson CANNOT stand in which one of the following spaces? The method of solution to this problem is rather mechanical: We merely place Nelson in one of the spaces offered. Then check whether it is possible to place the other people in the line-up without violating any initial condition. If so, then we eliminate that answer-choice. Then place Nelson in another space offered, and repeat the process. This diagram is consistent with the initial conditions. So N could stand in space 2. This eliminates choice (A). 2. Which one of the following spaces CANNOT be empty? Thus space 1 could be empty. This eliminates (A). However, this diagram does not leave room for C [recall C = not(1, 3, 5)]. Diagram I is thus impossible when space 2 is empty. Turning to Diagram II, we see immediately that space 2 cannot be empty, for this would make G second, violating the condition G = 3rd. Hence Diagram II is also impossible when space 2 is empty. Thus space 2 cannot be empty, and the answer is (B). Because grouping games partition elements into sets, the number of elements is often an issue. Counting may have been one of man’s first thought processes; nevertheless, counting possibilities is deceptively hard. This tends to make grouping games more difficult than ordering games. Pay close attention to the maximum or minimum number of elements in a group; this is often the heart of the game. Two players are chosen from Group A, and three from Group B.
Jordan starts only if Bird starts. Drexler and Bird do not both start. If Jordan starts, then Malone does not. Exactly 3 of the four fast-break specialists — Johnson, Bird, Jordan, Pippen — must be chosen. It is best to solve this problem without a diagram; however, we will still symbolize the conditions for clarity and easy reference. The condition “Jordan starts only if Bird starts” implies only that if Jordan is starting then Bird must be starting as well. So we symbolize it as Jordan — >Bird. The condition “Drexler and Bird do not both start” means that if one starts then the other does not. So we symbolize it as Drexler — >~Bird. Students often misinterpret this condition to mean that neither of them starts. To state that neither starts, put both at the beginning of the sentence: Both Drexler and Bird do not start. Note: Ewing, Laettner, and Robinson are independent because there are no conditions that refer directly to them. We now turn to the questions. 1. If Jordan starts, which of the following must also start? From the condition Jordan — >Bird, we know that if Jordan starts, then Bird must start as well. Now both Jordan and Bird are fast-break specialists, and three of the four fast-break specialists must start. So at least one of the remaining fast-break specialists — Johnson or Pippen — must also start. The answer is (D). Begin with choice (A). Both Ewing and Drexler are from Group A, so the remaining 3 starters must be chosen from Group B. Additionally, they must all be fast-break specialists since neither E nor D is — there are exactly 3 fast-break specialists. But Jordan and Pippen are the only fast-break specialists in Group B. So the third fast-break specialist cannot be chosen. The answer therefore is (A). This type of question can be time consuming because you may have to check all the answer-choices — save these questions for last. 3. If Malone starts, which one of the following is a complete and accurate list of the players from Group A any one of whom could also start? Jordan cannot start with Malone according to the condition Jordan — >~Malone. To play three fast-break specialists, therefore, Johnson, Bird, and Pippen are all required to start. Since both Johnson and Bird are from Group A and exactly two players from that group start, these two players comprise the complete list of starters from Group A when Malone also starts. The answer is (C). 4. Which one of the following players must start? Suppose Bird does not start. Then the 3 fast-break specialists must be Johnson, Jordan, and Pippen. But if Jordan starts, then from the initial conditions Bird must also start. Hence Bird must always start. The answer is (E). 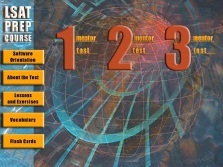 Assignment games match a characteristic with an element of the game. For example, you may be asked to assign a schedule: Bob works only Monday, Tuesday, or Friday. Or you may be told that a person is either a Democrat or a Republican. Because the characteristics are typically assigned to groups of elements, assignment games can look very similar to grouping games. Additionally, in grouping games the groups are often identified by their characteristics. However, in assignment games you pair each element with one or more characteristics, whereas in grouping games you partition the elements into two or more groups. Many assignment games can be solved very efficiently by using an elimination grid. An example will illustrate this method of diagramming. Dean Peterson, Head of the Math Department at Peabody Polytech, is making the fall teaching schedule. Besides himself there are four other professors — Warren, Novak, Dornan, and Emerson. Their availability is subject to the following constraints. Warren cannot teach on Monday or Thursday. Dornan cannot teach on Wednesday. Emerson cannot teach on Monday or Friday. Associate Professor Novak can teach at any time. Dean Peterson cannot teach evening classes. Warren can teach only evening classes. Dean Peterson cannot teach on Wednesday if Novak teaches on Thursday, and Novak teaches on Thursday if Dean Peterson cannot teach on Wednesday. At any given time there are always three classes being taught. To answer the following questions, we will refer only to the table, not the original problem. 1. At which one of the following times can Warren, Dornan, and Emerson all be teaching? The table clearly shows that all three can work on Tuesday night. The answer is (C). 2. For which day will the dean have to hire a part-time teacher? Dornan and Novak are the only people who can work Monday evenings, and three classes are always in session, so extra help will be needed for Monday evenings. The answer is (A). 3. Which one of the following must be false? (A) Dornan does not work on Tuesday. (B) Emerson does not work on Tuesday morning. (C) Peterson works every day of the week except Wednesday. (D) Novak works every day of the week except Wednesday. (E) Dornan works every day of the week except Wednesday. The condition “Dean Peterson cannot teach on Wednesday if Novak teaches on Thursday, and Novak teaches on Thursday if Dean Peterson cannot teach on Wednesday” can be symbolized as (P not W)< — >(N = TH). Now, if Novak works every day of the week, except Wednesday, then in particular he works Thursday. So from the condition (P not W)< — >(N = TH), we know that Dean Peterson cannot work on Wednesday. But from the table this leaves only Novak and Emerson to teach the three Wednesday morning classes. Hence the answer is (D). 4. If Novak does not work on Thursday, then which one of the following must be true? (A) Peterson works Tuesday morning. (B) Dornan works Tuesday morning. (C) Emerson works on Tuesday. (D) Peterson works on Wednesday. (E) Warren works on Tuesday morning. If you remember to think of an if-and-only-if statement as an equality, then this will be an easy problem. Negating both sides of the condition (P not W)< — >(N = TH) gives (P = W)< — >(N not TH). This tells us that Dean Peterson must work on Wednesday if Novak does not work on Thursday. The answer, therefore, is (D). Caution: Not all scheduling games lend themselves to an elimination grid. It’s sweet when this method can be applied because the answers typically can be read directly from the table with little thought. Only one-third of the assignment games, however, can be solved this way. Most often the game will require a more functional diagram, and you will need to spend more time tinkering with it. When you first read an assignment game, you need to quickly decide whether or not to use an elimination grid. You may decide to use a table. Then spend three minutes trying to set it up, only to realize you have taken the wrong path and have wasted three minutes. Unfortunately, exact criteria cannot be given for when to use an elimination grid. But this much can be said: if only two options (characteristics) are available to the elements — yes/no, on/off, etc. — then an elimination grid is probably indicated.